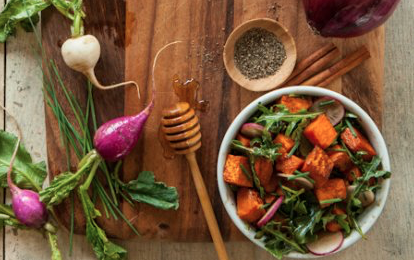 Purchasing locally grown foods benefits both the consumers and producers in our community. 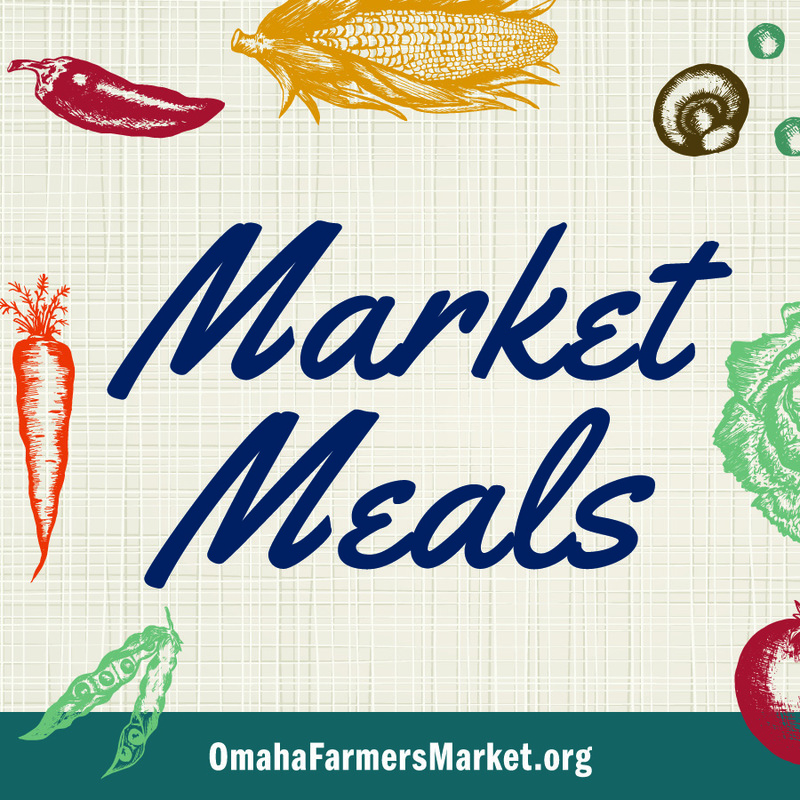 Omaha Farmers Market shares recipes, a harvest calendar and community resources to make it even easier to buy local. We are down to the final weeks of the Omaha Farmers Market, but that doesn’t mean the bounty it provides needs to end. There are many items at the Market that will last you well into winter and some you can stock up on and use until the Market reopens in the spring. 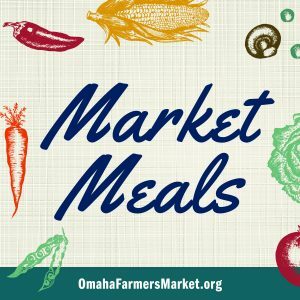 This is also the final Market Meals blog for 2017. Thanks for joining me this season. I hope you’ve tried a few recipes, and taken the time to share a good meal with even better company. Honey and Maple Syrup have a long shelf-life. Buy what you need to make it through winter and keep it in your pantry until the next market opens in the spring. Few things in life are better than waking up to see snow in the sky knowing you don’t need to leave the house because you have all the maple syrup you need to eat pancakes for days. Eggs last longer than you think. Mother Earth News tested storage methods for eggs back in 1977. They tested 360 eggs in 10 different methods. Their tests revealed that eggs kept in a refrigerated, airtight container were still edible, and even tasted good seven months later. Seven months might be a little long for my comfort level, but keeping eggs for two months is perfectly reasonable. You can also freeze eggs as a storage method, so don’t be afraid to stock up on them. Protein Ask farmers at the market about buying a whole or half cow, pig or lamb. We have a small deep freeze we keep in our garage to store meat, bread and stock. Every fall I buy 12-15 whole chickens. I keep them in the freezer and use them as needed throughout the next 6-9 months. We also share a half cow with a family member, so that’s in there as well. I don’t eat as much pork, so I usually buy those in individual cuts. For our family of four, I buy shoulders, a couple of pork loins and some sausages. I also supplement our meals with specialty items like bison, or lamb. I generally have all of this packed into that deep freeze along with deer because my husband is a hunter. It seems like a lot of meat for a small family, but we have large extended families and I feed them often. Bread I really enjoy good bread. When my children were babies I used to bake it. I was trapped at home for naptimes, and baking was a way to keep me busy and ward off the boredom that new mothering can sometimes impose. Now, I don’t bake as often, and I’m incredibly grateful for the fine bakers who show up with loaves of crusty goodness every weekend at the market. I generally purchase 6-10 loaves of various breads, and a few packages of pizza crust to keep on hand for those soup emergencies, and pizza night requirements. Winter Squash can last anywhere from one to seven months after it’s been harvested. 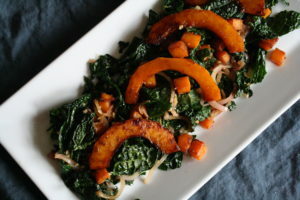 Acorn Squash has the shortest storage span of all the winter squash, butternut squash can last for six months so feel free to stock up on what you need for holiday dinners now. There is no reason to wait. Make sure you select blemish free squash, with unbroken or bruised skin. There may be large patch on the squash that looks a little rough. That is probably where it was resting on the ground. It should still be fine to store. If you’d like to read more about it check out this article HERE. Vinegar is wonderful way to brighten a dish. You want to find vinegar that is cloudy, which means it likely still has some of the “mother” in the bottle. 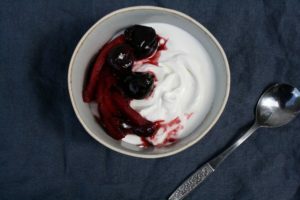 It will give you a sweet acidity rather than the harsh bite of many commercial, and mass produced brands. It can make all the difference in the dish. Organic apple cider vinegar is usually your best bet. Combine brown sugar, cayenne pepper and a pinch of salt in a small bowl. Set aside. Cut the neck of the squash from the bulb. Peel both sides. Cut the neck of the squash into ½ inch cubes. Slice the bulb inhalf, remove the seeds and cut into 1/4 inch thick slices. Heat oil in a 10 or 12-inch skillet over medium high heat. 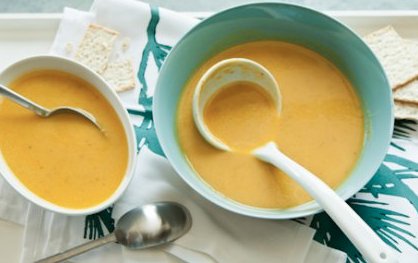 Add the cubed squash in a single layer, stir to coat. 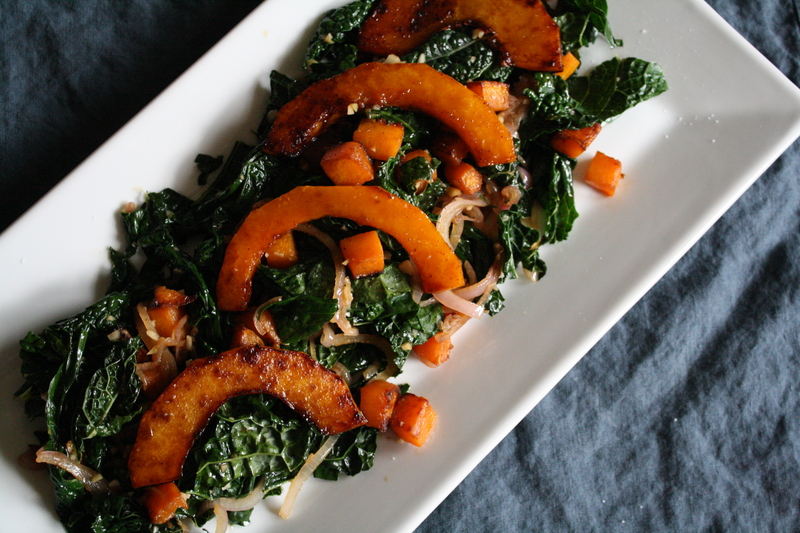 Leave untouched for about 4 to 5 minutes, until bottom side of squash is a deep brown color. Add shallots. Cook for about 2 minutes. Add garlic. Cook for another minute or so. Add torn kale, and apple cider vinegar. Stir to coat the kale in vinegar, shallots and garlic, until wilted, and vinegar has evaporated. 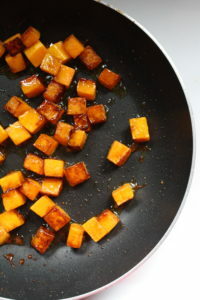 Add the cubed squash back to the pan stir to combine and warmed through. Transfer to serving dish. Warm the squash slices through, place across the top of the kale mixture. Finish with a sprinkle of kosher salt and serve. Per Serving: 140 calories (50 from fat), 6g total fat, 1g saturated fat, 280mg sodium, 20gcarbohydrates, (5 g dietary fiber, 4g sugar), 6g protein. The sky was yellow — a combination of haze from wildfires and the glow of the sun. My husband and I debated opening the windows in our home. We often debate these things. It’s part of marriage. The mundane daily details of whether the house is too hot or too cool. These become matters of great importance when you share your life with someone. We opened the windows. The air was cool, and a light breeze blew across a field of golden rod. We stopped trying to tame that field years ago, and it’s become my favorite place. There is value in learning to let things go, and to let them become what they will be. When we first bought our home and the land that came with it my husband spent hours mowing it. Then we visited a bison rancher named Dave who stopped mowing the Kentucky Blue Grass around his lawn that summer. He didn’t have the time so he let it go. It grew long and flopped over. I thought it was beautiful. We came home and stopped mowing most of the acreage. I wondered what would become of it. How wild would it get? Would the grass just grow long and flop over? Would something native grow in its place? Would I see more pheasant or possibly the imprint of a deer who had bed down for the night? At first we just looked like bad neighbors. The grass was long and unruly. I loved it even more. The seed heads shot up and dried. In the winter ice formed on the long stalks creating small cylinders my children used as straws for the five seconds they lasted. The weeds grew. I didn’t see a pheasant. Then seemingly out of nowhere our state flower arrived. First, just a little patch – an oasis of gold in a sea of green and brown grass. Then the milkweed arrived. I had hoped to be a stop for a monarch or two, but nothing yet. At least not that I’ve noticed. Now the field is mostly filled with the yellow, towering plums of goldenrod and it’s stunning. Beautiful things come from letting go, but it takes time. Fall is approaching, which means the apples trees at the bottom of the goldenrod field are ready. I’m not easily contained so I spend as much time outside for as long as I can. I sit in the black rocking chairs on our front porch wrapped in blankets, sipping tea and eating hot spiced apples well past the time reasonable people relent to the changing of seasons. This apple dish can be made fresh the morning you want to eat it, or doubled and reheated as needed for breakfast throughout the week. Combine everything in a medium sauce pot. Cook over medium heat for 15 minutes until apples are soft, but still hold their shape, stirring occasionally. Spoon what you want to eat into a serving a bowl. 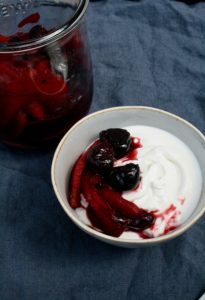 Most of the time I eat the apples on their own without any accompaniments, but they are also delicious with a dollop of yogurt, some toasted almonds or sprinkled with a bit of granola. Breakfast is served. Transfer leftovers into a jar to cool. Store in an airtight container in your fridge for up to a week. Spoon over ice cream or stir into your morning oatmeal. Reheat as needed.